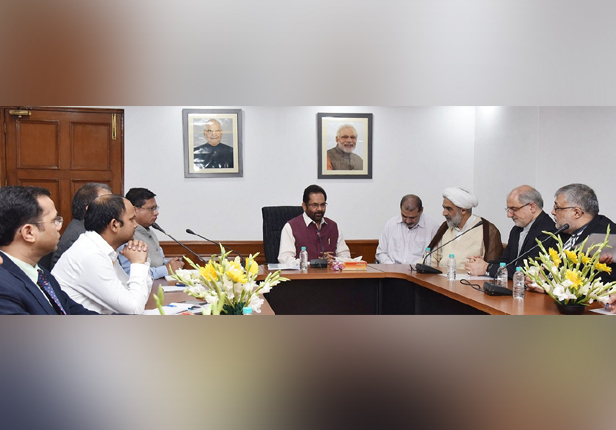 Union minister Mukhtar Abbas Naqvi today described terrorism as the "biggest enemy" of Islam and called on the entire world to unite against it. The minority affairs minister made the remarks after an Iranian delegation comprising Hojjat ul Islam Dr Mohsen Ghomi and Abouzar Ebrahimi Torkaman, head of the Islamic Culture and Relations Organisation, called on him here. "Terrorism is the biggest enemy of Islam and humanity, and the entire world will have to work unitedly to defeat such evil forces," a statement quoted Naqvi as saying at the meeting. He reiterated that the Narendra Modi government at the Centre has adopted a "zero tolerance" policy against terrorism. "Peace, unity and harmony is in the DNA of India. This strength of India has always defeated evil forces. We all have to unite to eliminate the forces that are misusing Islam as their security cover," he said. Naqvi noted India and Iran enjoy very old and strong relations. He said the prime ministers visit to Iran last year has taken the bilateral relations to newer heights and the visit of Iranian delegation will further strengthen the ties. "India and Iran can play an important role against terrorism at the global level," the minister said.